Together with the authors' Volume I. C*-Theory, the two parts comprising Functional Differential Equations: II. C*-Applications form a masterful work-the first thorough, up-to-date exposition of this field of modern analysis lying between differential equations and C*-algebras. The two parts of Volume II contain the applications of the C*-structures and theory developed in Volume I. They show the technique of using the C*-results in the study of the solvability conditions of non-local functional differential equations and demonstrate the fundamental principles underlying the interrelations between C* and functional differential objects. The authors focus on non-local pseudodifferential, singular integral, and Toeplitz operators-with continuous and piecewise continuous coefficients-convolution type operators with oscillating coefficients and shifts, and operators associated with non-local boundary value problems containing transformation operators of an argument on the boundary. They build the symbolic calculus for all these classes of operators, use it to treat concrete examples of non-local operators, present the explicit computation of their Fredholmity conditions and the index formulae, and obtain a number of related results. 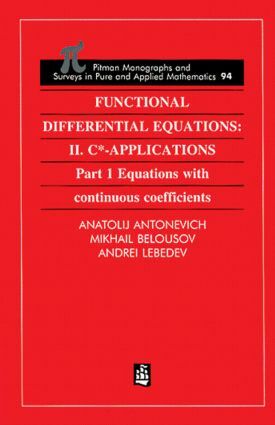 Part 1: Equations with Continuous Coefficients and Part 2: Equations with Discontinuous Coefficients and Boundary Value Problems can each stand alone and prove a valuable resource for researchers and students interested in operator algebraic methods in the theory of functional differential equations, and to pure C*-algebraists looking for important and promising new applications. Together these books form a powerful library for this intriguing field of modern analysis.